My favorite rapper out today. That honor was held by Master P, Ma$e, Pastor Troy, Young Jeezy, Lupe Fiasco and now by J. Cole. 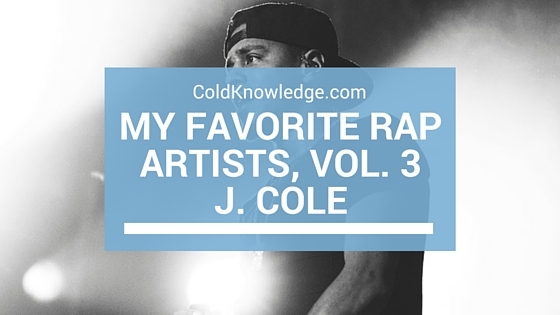 The reasons why I like J. Cole as the best right now is simply because he combines the lyricism and storytelling that's lost in today's Hip-Hop & Rap scene. I've said for years that's the difference between rappers and MC's. Rappers sole purpose is to flaunt and tell everyone of the success it took to get there, and there's nothing wrong with that. Because personally that's the motivational music when I need my goals accomplished, but like anyone with a thought process that likes to delve into deeper meanings, Hip-Hop will always have my heart. I'll always appreciate the MC's that come out and use their minds to rip it each and every single time. The story telling in music over production that is classic is just amazing, and that's what is under appreciated. I know popular opinion and music that doesn't require people to think that much is the wave, but to those who value MC's and their ability to put it together, you are appreciated. The reason I stand by J. Cole is because he can tell a story like none other, and he tells stories of things that I've done in college in his earlier career. That's what turned me on to him in the first place and I haven't looked back since. When I made it out of training and to my duty station, he dropped Friday Night Lights. That literally changed things for me at the time, I must've literally listened to that tape dozen's a time a day. I actually skipped over that track with Drake for the simple fact that it was everywhere, but everything that he's put out, I have. I literally listen to him all the time, and currently his 2014 Forest Hill Drive album is still the best that any of the new wave cats have put out since 2014. I stand by that firmly for the simple fact that he makes great music that's actually going to last and hopefully be appreciated properly like it's supposed to. All in all, he gets better with every single album, why else would Jay Z sign him and support him. Regardless of album sales and public opinion, he's the next best thing, period. I'm sorry to those who support Drake, but he doesn't really rap about anything of interest to me, when he raps at all. But I'm not a Drake hater, but when it comes to the best, he has to take a seat behind Cole and others, but that's a different story for another time. But all in all, he's on my list and I'm sure he'll give me more than enough ammo in the future when it comes to having a debate about why I think he's better than the rest, and I'm ready for it. So if you haven't given him a chance, take some time to give it a spin, he's definitely more than what people give him credit for, and he's not as complicated as others make him seem. J. Cole is the future, and you should take a chance on that ride.